We are glad to bring you new studies on topics such as an overview of the Social Cash Transfer programme in Zambia, to an evaluation of the PAA Africa programme in Mozambique. We also bring you the latest news and updates regarding the Centre's activities. 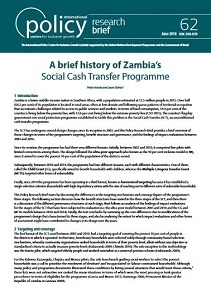 In the Policy Research Brief "A brief history of Zambia's Social Cash Transfer Programme", Pedro Arruda and Laura Dubois (IPC-IG) discuss the different targeting mechanisms and coverage figures throughout the programme’s history, and analyse the evolution of its benefit and governance structures. This publication is available in English and Portuguese. The Working Paper “PAA Africa's contributions to the consolidation of PRONAE in Mozambique”, by Carolina Milhorance de Castro (Food and Agriculture Organization of the United Nations—FAO), presents results from the Purchase from Africans for Africa (PAA Africa) programme pilot to qualitatively evaluate the programme’s contributions to the consolidation of an institutional market strategy for family farmers in Mozambique. This publication is available in English and in Portuguese and its accompanying One Pager is also available in English and in Portuguese. Following up on the launch of the report "Overview of non-contributory social protection programmes in the Middle East and North Africa (MENA) region though a child and equity lens", by Anna Carolina Machado, Charlotte Bilo, Fabio Veras Soares and Rafael Osorio (IPC-IG) in partnership with UNICEF, we are glad to bring you a new batch of three One Pagers, part of a series featuring each of the 20 countries mapped in the original study: “Non-contributory social protection through a child and equity lens in Egypt”, available in Arabic, English, French and Portuguese; “Non-contributory social protection through a child and equity lens in Iran” (Arabic, English, French and Portuguese); and “Non-contributory social protection through a child and equity lens in Iraq” (Arabic, English, French and Portuguese). 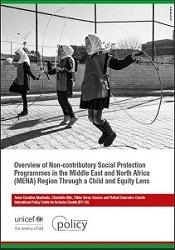 The Executive Summary of the Overview of Non-contributory Social Protection Programmes in the Middle East and North Africa (MENA) Region Through a Child and Equity Lens report, by Anna Carolina Machado, Charlotte Bilo, Fábio Veras Soares and Rafael Guerreiro Osorio, is now available in Arabic and French. It was previously released in English. Finally, the Policy in Focus issue titled “Women at work: addressing the gaps” is now available in Spanish, following its launch in English this past March. Presented by specialist guest editors Carolina Robino (Canadian International Development Research Centre—IDRC) and Raquel Tebaldi (IPC-IG), it features 15 compelling articles by leading academics, policy specialists and practitioners. Our colleagues and partners from the socialprotection.org online platform will host a interesting webinar, jointly organised by the IPC-IG and HelpAge International, on 21 June: “Social accountability in the delivery of social protection: enabling environment”. This is the final webinar of a three-part series and it will discuss some aspects of an enabling environment for social accountability in social protection. It will specifically focus on legal and policy aspects, as well as the role of technology. Register for free here and visit the platform to learn more about upcoming webinars. The socialprotection.org online platform is hosted by the IPC-IG. The IPC-IG is glad to announce that the paper “Universal social protection in Tunisia: comparing the effectiveness and cost-efficiency of food and energy subsidies with a proposed universal child allowance programme”, by our researchers Mario Gyoeri and Fabio Veras, was published in the latest issue of the International Social Security Review (ISSR) journal. This ISSR special issue focuses on social protection in the MENA countries. In this article, our researchers compare the effectiveness and efficiency of a food and energy subsidy programme—currently being implemented by the Tunisian government—in reducing poverty, and of a universal child allowance programme that is being proposed as a better alternative to current subsidies and narrow poverty-targeting cash transfer programmes. Download the article here. IPC-IG Researcher Raquel Tebaldi participated this past April in the international conference “Potsdam Spring Dialogues 2018: Strengthening Social Protection in Africa: National, Regional and international Strategies", organised by the Development and Peace Foundation (Stiftung Entwicklung und Frieden—SEF) in Potsdam, Germany. In the event, she joined a round-table discussion titled "Social insurance: a social contract as a basis for contributory approaches?". We are pleased to share a video interview she granted SEF, where she explains how social protection can be improved for women. We also invite you to read two very relevant recent issues of our Policy in Focus magazine, featuring Ms. Tebaldi as guest editor: “Women at Work: addressing the gaps" and "Social Protection: towards gender equality"
The IPC-IG joined the European Development Days (EDD) conference, organised by the European Commission, on 6 and 7 June, in Brussels. This annual event gathered the development community to share ideas and experiences to inspire new partnerships and innovative solutions to the world’s most pressing challenges. Our Senior Project Officer, Mariana Balboni, participated in the sessions focused on social protection: “Does shock-sensitive social protection promote gender equality?”, organised by the German Development Cooperation (Deutsche Gesellschaft für Internationale Zusammenarbeit), and "Women on the rise: no one left behind! ", organised by Bridging the Gap. Ms. Balboni also participated in two events held at the Permanent Mission of Finland to the European Union in Brussels, on 7 June, in preparation of the 63rd session of the UN Commission on the Status of Women (CSW), which will take place in March 2019 under the priority theme ‘Social Protection Systems’. The first event was a workshop titled "Gender, Care Economy and Social Protection Systems—Structural Transformations for Reaching the SDGs", organised by European Union Social Protection Systems Programme (EU-SPS) and UN Women. The second event was the first meeting of the Social Protection Inter-Agency Cooperation Board’s (SPIAC-B) Gender Working Group. Our Senior Research Coordinator Fabio Veras, together with Ms. Ana Paula de la O Campos ( Food and Agriculture Organization of the United Nations, FAO), participated in a joint mission to Panama City, from 22 to 24 May, as part of an agreement between the Centre and FAO to develop a capacity-strengthening course on the use of poverty analysis. The objective is to design, implement, monitor and evaluate multisectoral policies to tackle rural poverty. During the mission, they presented and discussed the course programme with officials from the Government of Panama in a meeting organised by the Social Cabinet. Panama is the second country to participate in the adaptation of this course, after Morocco. The virtual phase of course in Morocco started on 8 May 2018, featuring a webinar and weekly multimedia content and exercises hosted on the socialprotection.org platform. The face-to-face phase will take place in the week of 25 June in the Moroccan capital, Rabat. Fabio Veras and IPC-IG's Research Consultant Carolina Bloch will be among the facilitators, and the course will feature lectures by local specialist on public policies. In Panama, the virtual phase of the course will start on 2 July and the face-to-face phase will start in the week of 6 August. Would like to work with us? Check out some job opportunities available at the IPC-IG here. We are also accepting applications from outstanding students for our 2018 Internship Programme. We are looking for graduate-level students who are passionate about international development and who believe that inclusive growth, the dissemination of knowledge and social development have the power to transform societies. Requirements and information on how to apply are available here. If you know someone who would be interested in joining the programme, help us spread the word.